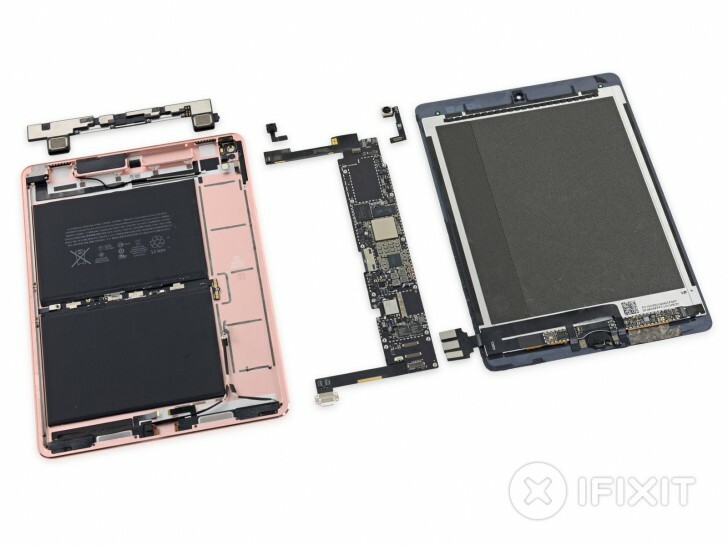 The time for the iPad Pro 9.7 teardown is upon us, thanks to the professional disassemblers at iFixit. What everyone expected to be an iteration of the iPad Air 2, turned out to be a scaled down version of the 12.9" iPad Pro and as such every millimeter inside the alloy body is put to good use. The iPad Pro 9.7" is hard to open and requires a lot of patience and heating, but once open you can see just how cramped the inside is. The largest component, naturally, is the battery. In this iPad Pro it has a rating of 27.91 Whr (7,306mAh), which is slightly better than the iPad Air 2's 27.62 Whr. Sadly, for those who want to repair their iPad Pro 9.7" on their own turf, it's not that easy. iFixit gives the slate a repairability score of 2/10 (10 being the easiest to repair). The fused front panel is one of the components that will be most expensive to fix and carries the risk of damaging the LCD during opening. Additionally, there are "gobs of adhesive", which hold the components inside resulting in more difficult repairs.